At Lattice, we see training as both a practice rooted in sport science and personal experience. This is why we are as equally committed to providing optimal training methods and also easily useable training resources. 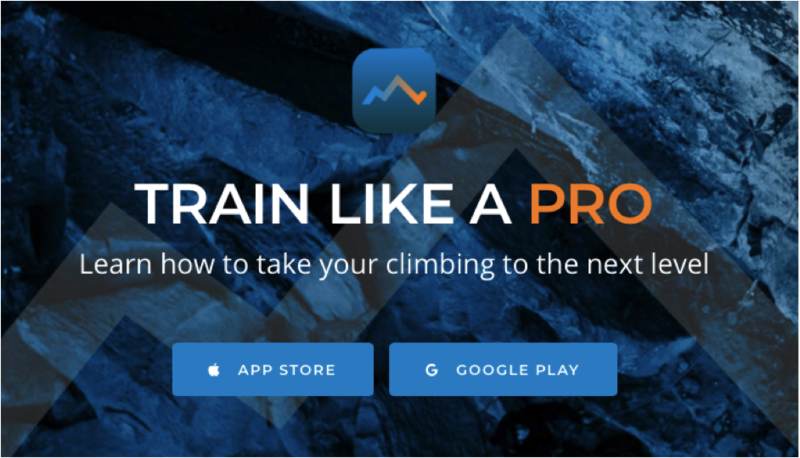 The Crimpd app is the first climbing training app which integrates years of training data to create an athlete monitoring tool for climbers. We recognise that the only way to know if you are completing your training in accordance with a climbing goal is to monitor it. That’s where load scoring comes in. With our eight person in house coaching team – led by Tom Randall and Ollie Torr, who have a combined 20+ years of coaching experience – we have developed loading scores in conjunction with the team behind the technological aspects of the app. 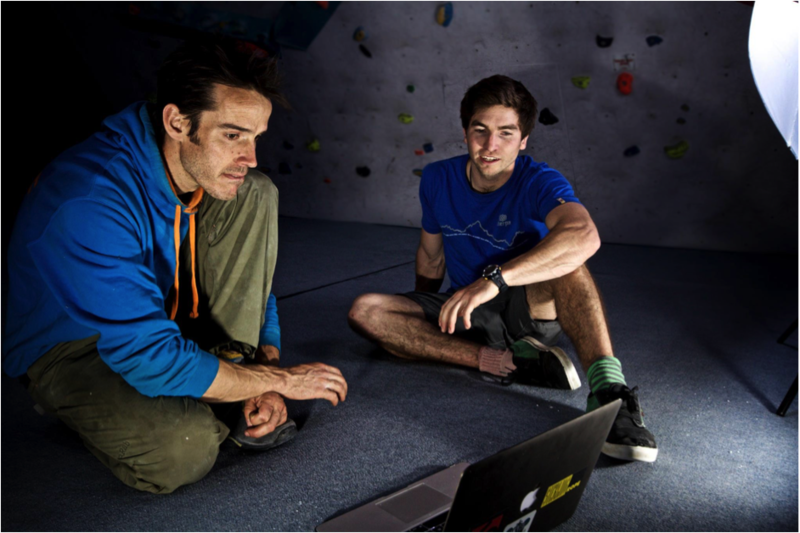 Our experience of rigorous training evaluation and research within climbing means that scores generated to monitor your training are never just an arbitrary number. Every workout you complete will place some form of physiological stress on your body. In reaction to this stress, your body adapts to become stronger, fitter and/or more flexible with the end goal of becoming a better climber. The load score depicts the extent of stress each workout places on your body. Each training aim is associated with a desired physiological adaptation, a training stimulus and a perception of effort. For example, finger strength sessions aim to increase size and recruitment of forearm muscles, provide a high intensity isometric contraction as used in climbing, and make a climber feel as though they are working close to their maximum effort in order to feel ‘powered out’ by the end of the workout. By understanding the training stimulus, we can inform what load scores are associated with every type of training. As with all types of exercise, volume can be quantified by sets, reps and time under tension. Climbing training is no different. For example, a boulder session may require you to complete 10 different problems, once each. Each problem should be around 8-10 moves long. Therefore, we know how many moves and problems were completed along with the amount of time spent on the wall. By calculating the volume of exercise completed during each workout we can further detail the stress placed on your body. Climbers around the world are all aware of their local grading system. Despite the many options available, from Font to Hueco, climbing grades can be correlated to represent the difficulty of a route or problem. 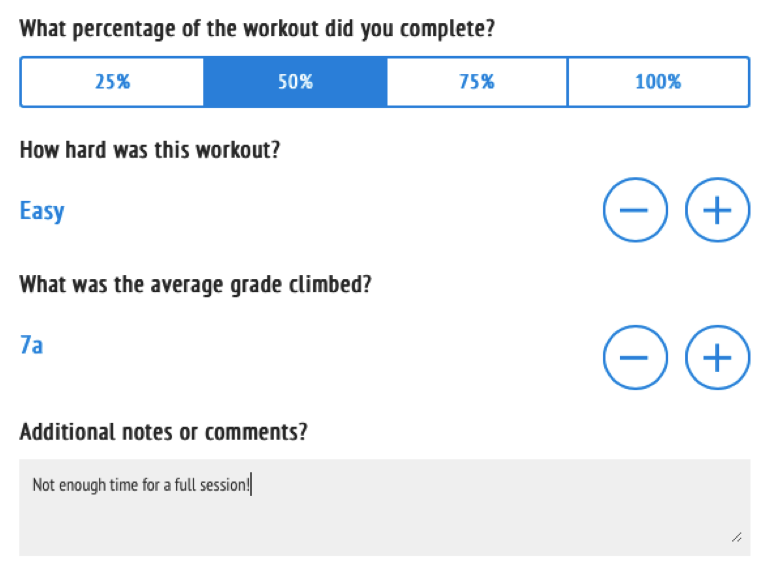 Our load scores take into account the intensity and grades of the workouts you complete. This means that you can complete the same workout for several weeks whilst monitoring progress. For example, if you complete a route climbing session on week 1 using a 5:11 route but on week 10 use a 5:12 route, you know you have increased the intensity of this workout. This same method is used for conditioning, fingerboard and campus sessions where intensity is dictated by movement difficulty or weight used. In addition to the steps above, we also consider success rates when calculating load scores. 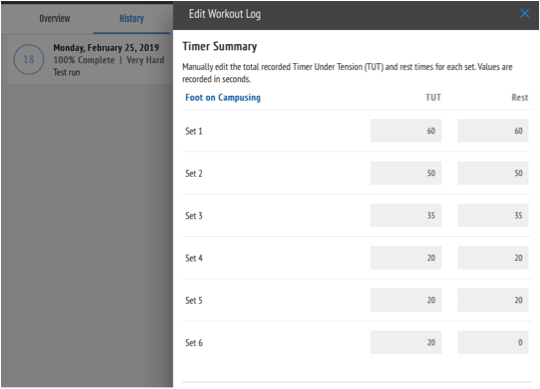 If you complete 50% of a workout then you will receive 50% of the expected load score, as it will be assumed that only half of the volume was completed. Where can I see changes to my load scores? 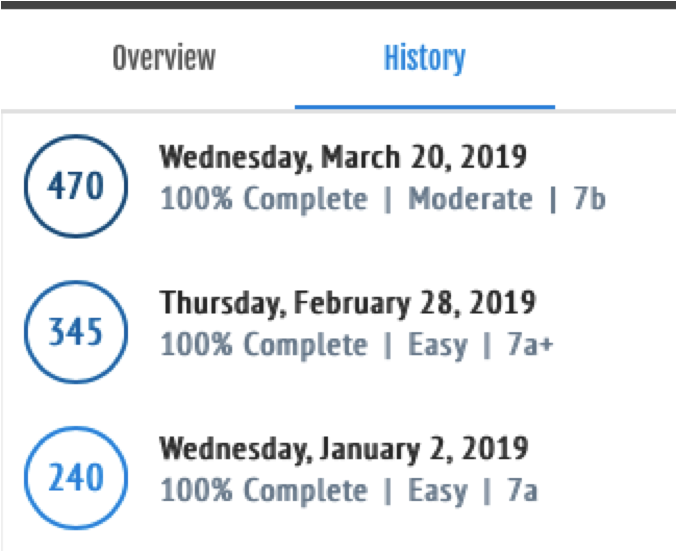 Changes to load scores in each individual workout can be found on the history tab of each workout. This will provide a summary of what load score was achieved each time you completed the workout. To find more details of the recorded score, click on the scores to view the breakdown page. Changes to overall workload scores can be found on the analytics page. By changing the graph view to load scores, you will be able to see how your total work load scores have changed over a 1 and 3 month period. Furthermore, using the same graphic or the chart below, you will be able to see the distribution of workloads per training stimulus. The higher the percentage of a given stimulus – such as endurance – the more stress was placed on the body during endurance workouts, which will mean a higher change of adaptation towards better endurance.